A few summers ago I found some seed packets at WalMart for the Giant Heavenly Blue variety. Of course I just had to purchase a packet. I came home and couldn’t wait to scatter the seeds around the light post in my back yard. I was rewarded handsomely with gorgeous blue blooms in no time. I had hoped they would re-seed themselves so I didn’t save any seeds for the following year. Sadly, they didn’t come back and WalMart hasn’t carried them since. I know I can probably order them online from a seed company, but I just haven’t done it. I’m lazy like that. It really doesn’t matter, though, ’cause you know why? 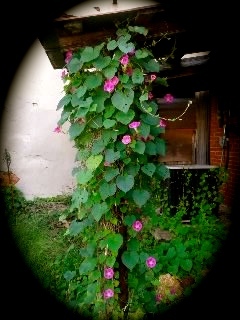 The morning glory grows all over my little town of Spring Hope. Some might consider it a weed. I know some varieties are very invasive and can take over a garden if not cultivated and kept under control. I guess I’m a softie, though. I love the way a morning glory plant beautifies the most unattractive places. I love the way it grows along the roadsides and fields. I love the way it clings to rotted fence posts and rusty, metal farm equipment. I love the way it shoots pops of bright magenta pink, cornflower blue, and even pure white across the landscape. I love how a morning glory grows fast, spreads quickly and tolerates poor soil. I love how it climbs a porch trellis and offers shade on hot summer days. I love how it’s leaves are shaped like hearts and it’s white centers like stars. But most of all, I love how a morning glory loves the sun, how it’s blooms close up at night into thin spirals and takes a rest in the cool night air from a day of beautifying the earth. I love how it unfurls in the early morning as the sun begins it’s ascent over the treetops. It’s as if the morning glory greets each day with purpose. So it is with the child of God. We’re called to bloom in the most unlikely places. We’re called to add beauty to the most unattractive corners of the world. We’re called to tolerate the poorest of soils, to climb the most difficult mountains, to offer a bit of respite to those wandering in desert lands. We’re called to share our hearts, shine like stars and then take a welcome nighttime rest that we might bloom with purpose at the rising of each new day.